56 | TH E M R EP O RT O R I G I NAT I O N S E R V I C I N G DATA G O V E R N M E N T S E C O N DA R Y M A R K E T THE LATEST DATA Untapped Urban- Development Potential Several major U.S. metros have dozens of acres of unused land right in the heart of the city, which could be leveraged for housing. U rban sprawl, by its very nature, means cities are forever expanding outward. Initially, their borders expand, and then eventu- ally, as they bump up against those constraints, the challenge becomes figuring out ways to make the most use of the space and resources available. With housing at a premium and inven- tory failing to keep up in many markets, the process of examin- ing whether the available land is being used to its full potential is more important than ever. But what if there's untapped potential not on the fringes of the suburbs but right in the heart of many cit- ies' core business districts (CBDs)? COMMERCIALCafe recently conducted an urban-development study examining just this prospect and entitled, "What to Do with All the Vacant Land in Major US CBDs?" COMMERCIALCafe nar- rowed its focus to 25 major U.S. cit- ies, examining vacant land available within the cities, local construction activity, and a survey of 1,549 local residents of the cities to determine what sort of development would be most desirable for them. Within the CBDs of those 25 cities, COMMERCIALCafe found a total of 584 acres of undeveloped land—equivalent to nearly 442 standard-size NFL football fields. Moreover, the study found that "some of the least dense urban cores have seen the slowest devel- opment activity during the past five years, while developers have been significantly busier in the more tightly packed city downtowns." 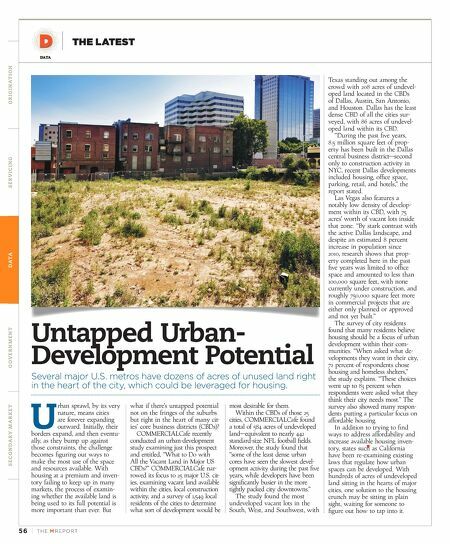 The study found the most undeveloped vacant lots in the South, West, and Southwest, with Texas standing out among the crowd with 208 acres of undevel- oped land located in the CBDs of Dallas, Austin, San Antonio, and Houston. Dallas has the least dense CBD of all the cities sur- veyed, with 86 acres of undevel- oped land within its CBD. "During the past five years, 8.5 million square feet of prop- erty has been built in the Dallas central business district—second only to construction activity in NYC, recent Dallas developments included housing, office space, parking, retail, and hotels," the report stated. Las Vegas also features a notably low density of develop- ment within its CBD, with 75 acres' worth of vacant lots inside that zone. "By stark contrast with the active Dallas landscape, and despite an estimated 8 percent increase in population since 2010, research shows that prop- erty completed here in the past five years was limited to office space and amounted to less than 100,000 square feet, with none currently under construction, and roughly 750,000 square feet more in commercial projects that are either only planned or approved and not yet built." The survey of city residents found that many residents believe housing should be a focus of urban development within their com- munities. "When asked what de- velopments they want in their city, 72 percent of respondents chose housing and homeless shelters," the study explains. "These choices went up to 83 percent when respondents were asked what they think their city needs most." The survey also showed many respon- dents putting a particular focus on affordable housing. In addition to trying to find ways to address affordability and increase available housing inven- tory, states such as California have been re-examining existing laws that regulate how urban spaces can be developed. With hundreds of acres of undeveloped land sitting in the hearts of major cities, one solution to the housing crunch may be sitting in plain sight, waiting for someone to figure out how to tap into it.